Please note that the content of this book primarily consists of articles available from Wikipedia or other free sources online. The South Devon Railway 2-4-0 locomotives were small 2-4-0T broad gauge locomotives operated on the South Devon Railway, mainly on its branch lines such as that to Ashburton. 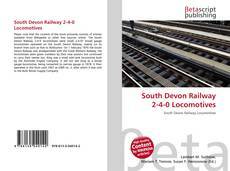 On 1 February 1876 the South Devon Railway was amalgamated with the Great Western Railway, the locomotives were given numbers by their new owners but continued to carry their names too. King was a small side-tank locomotive built by the Avonside Engine Company. It did not last long as a broad gauge locomotive, being converted to narrow gauge in 1878. It then operated in this form until 1907 as GWR no. 2, after which it was sold to the Bute Works Supply Company.